The Air Force Standard is a three (3) plate assembly measuring 4″ x 7″ x 1.06″. The Standard contains twenty (20) fastener holes with diameters from 0.156 to 0.750″, two (2) screw holes, and two (2) dowel pins holes. The Standard also contains a total of 66 EDM notches in various locations. Notch depth and length vary. Width is 0.004″ for all notches. Material is Aluminium Alloy 7075-T6, QQ-A-250/12. 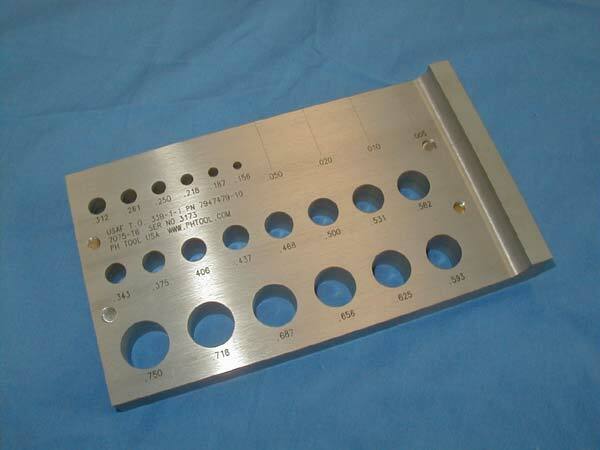 Finished standard is anodized per MIL-A-8625, Type II, Class 1. The Standard can also be made in titanium, steel, stainless steel or other alloy. The Standard is manufactured in accordance with U.S.A.F. Tech Order 33B-1-1, Figures 4-47 through 4-49. NSN 6635-01-092-5129, P/N 7947479-10. Be the first to review “AIR FORCE GENERAL PURPOSE EDDY CURRENT STANDARD” Click here to cancel reply.